This week at the Global Design Project challenge blog we are CASEing this lovely card by Shawn de Oliveira. 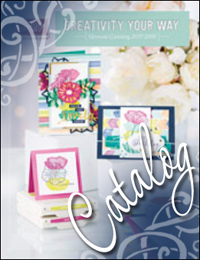 It's good to be back this week...especially with all the beautiful new stamps and products available in the new 2019 Spring Occasions Catalog and the start of Sale-a-Bration. I did a loose interpertation of Shawn's layout and used a similar color pallet of Mint Macaron, Petal Pink, and Tranquil Tide. I stamped multiple flowers and a teacup with the Tea Together Stamp Set (#148779) on page 49 of the Occassions Catalog. Next, I colored the images with Stampin' Blends markers (Petal Pink and Mint Macaron) and then added even more depth to the images by using Watercolor Pencils (Calypso Coral/Light Gray). This is one of my favorite techniques and gives me a lot of control over coloring the images. I also stamped the greeting from the same set onto some Mint Macaron DSP. Here is the exciting part...you can earn the coordinating Tea Time Framelits Dies (#149697) with a $100 purchase (US) during Sale-a-Bration. How wonderful is that! There is also a fabulous new die set called Rectangle Stitched Framelits Dies (#148551). I have been longing for SU release a set like this, so it was the very first item I placed on my order. I cut the outside frame and then cut a second frame inside to give some depth to the card front. I also used some of the Whisper White 5/8" Flax Ribbon (#148764) to create the look of a tablecloth. Finally, I added some Gingham Gala Adhesive-backed Sequins (#148561) and some clear epoxy droplets (retired).